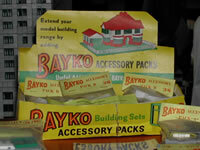 Not too surprisingly, comparatively little pre-war BAYKO packaging has survived through the years, so much has to be deduced from precious little information. Pre-war BAYKO price lists specified fixed quantities, e.g. so much for 6 Pillars. Boxes matching these quantities survive, affirming this as the standard approach. …though a full pack of 6 Arches were unlikely to be snapped up by 1930s children, so these, at least, were Wholesale Packaging. I suggest the key distinction is whether or not these items were on permanent display in toyshops. Post-war Wholesale Packaging, including the MECCANO era was noticeably much more functional. 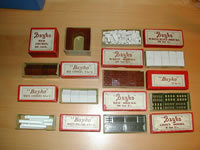 Click here for more on BAYKO Wholesale Packaging. This next item continues the above argument, as it were, but much later, i.e. close to the MECCANO takeover, in 1959, or thereabouts. The date is based, in part, on the frequency with which these items emerge - they do have a scarcity value! The images here [right & left] show BAYKO's whole experiment [?] with the [then] latest packaging technology - as far as I'm aware, anyway. The first [left] shows a pre-printed, transparent, cellophane bag which originally contained a “Gate and matching Balustrade”, a pair of items which would previously have been held together with an elastic band. The second [right] shows another pre-printed cellophane bag, containing “one only Side Window LEFT” and “one only Side Window RIGHT”, which were also previously sold as pairs held together by an elastic band. This innovation must have been about product presentation, which is relevant here, but I cannot envisage [to me a much nicer word than envision] a situation where they were actively displayed, so perhaps this really is Wholesale Packaging. …please click here to email me with your info. …three different Retail Packs [A, B & C] were launched in 1958. …which could then be folded to form a display case as shown. The case holds 12 x Pack A, 8 x Pack B or 6 x Pack C.
Click here for more on these packs. These packs were a valiant, if somewhat belated, attempt by Plimpton, to improve their 'in-store presence' as the marketeers might put it. A couple of years after MECCANO took over, they too introduced a range of Retail Display Packs. 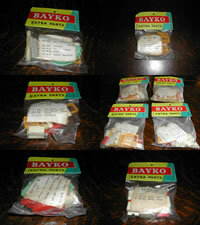 In 1962 they launched 6 different BAYKO packs, #1B to #6B, with mixed contents. I don't know whether or not there was also a display case as in the Plimpton era. Literature from the period refers to the availability of a 'display dispenser' which is “FREE on loan” to retailers who took 10 of all 6 pack types. The success of these retail packs may be reflected in the fact that they almost certainly survived until BAYKO's death - they were included in the 1963 MECCANO price list. I think, to be fair to Mr. MECCANO, there was a more coherent theme to each of the six packs than was the case with the Plimpton packs, which I suspect would have helped sales. …please click here to e-mail me.